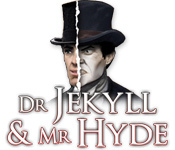 Dr. Jekyll & Mr. Hyde: The Strange Case is rated 3.1 out of 5 by 10. Rated 4 out of 5 by sfr8rfan from I Liked It! I've never played anything like this before so of course, I didn't know what to expect. The game is very different. This review will be as well. I think games typically fall into one of these two categories: they're driven by the storyline or they're mini-games and HOGs which are loosely connected through the story. The Strange Case of Dr. Jekyll and Mr. Hyde is faithful to Robert Louis Stevenson's Novella and the HOGs lead you through the story. In this unusual case, I don't think games or storyline predominate. They go hand in hand. Without the HOGs the story wouldn't progress. Without the story line the HOGs and mini-games would be nonsense. HOGS and Mini-Games: In H and J, the assortment of HOGs is large and the format is unusual. The mini games are fewer in number, more familiar in format and with few exceptions (maybe one, as I think back on it) present little challenge. Maybe because I've not played anything like this before I found it fun. It was just really refreshing to play something completely off the hook. How was it off the hook? How were the HOGs and their formats unusual? In most cases you entered a room and found a variety of items. These items were spread throughout the room, not dumped in a pile. While you could affect a "close up" it wasn't really very close so you had to make reasonable guesses and deduce, based on the item and where it should be in the scene. Along with the list pick there were multiple- gets: find 11X this or 15X that. So, as the actions were similar to all list-pick HOGs, it was the ambiance that was different and which I appreciated. I had the feeling of really being in a big room and searching high and low for the appointed items. Among the various mini-games were "finding the differences." This is always a favorite of mine so I appreciated it. Visual/Sound Quality: Visuals: While many have complained that the graphics are very grainy I have a different perspective. It felt like late 19th century London. I wasn't put off by the visuals at all. Sound quality: Here, I think, is where most people will have their most pronounced problem: there's is no voice over, only written dialog. In this era we're used to hearing voice actors and the lack thereof is jarring to us. With the exception of slightly scary background music, the game is very silent. Maybe we're uncomfortable with silence. I was not. When all is said and done, I can't convince you that this game is great. I liked it. I think that the style of the game matches the subject matter of the game and in a world of glitz I understand that this game and its ilk just can't compete. I, for one, have already purchased other games made by this developer, that are very similar in style. I'm looking forward to the intrigue of a Vatican thriller and to the depression era thuggery of the story of Bonnie and Clyde. As always, the trial is FREE. Try it out. Ya never know. Just try to keep an open mind. Rated 4 out of 5 by queenjanis from Dr. Jekyll & Mr. Hyde: The Strange Case I usually try a game, whether it gets bad reviews or not, everyone has different opinions. I like the ( weird ) games anyway. What I don't like is when a game has a boring HO around every corner. It makes me lose my interest when there are too many of them in a game. I hate when the items are way too small and hard to find. I will buy the ones that have an interesting story line, voice, and a little scary. Rated 4 out of 5 by qpqt from Hmm -- Tried It, BOUGHT IT I like trying games with bad reviews because they usually end up to be not that bad. The graphics are not grainy as one reviewer stated. Scenes may be a little dark, but the objects are distinguishable. You start with 3 hints and collect more by clicking on the gold star in each scene (the stars are out in the open, tough to miss). If you use a hint in a scene, you will have another gold star to click on. Also, for completing mini games, you are awarded 2 hints, but the maximum hints you can have is 6. The mini games can be challenging, but if you need help, you can click on a puzzle piece that shows you what the end result should look like. When you need to go back to another scene, there is an arrow to direct you where to go. The story like is OK, nothing earthshaking. If you are looking for a challenge, look elsewhere. 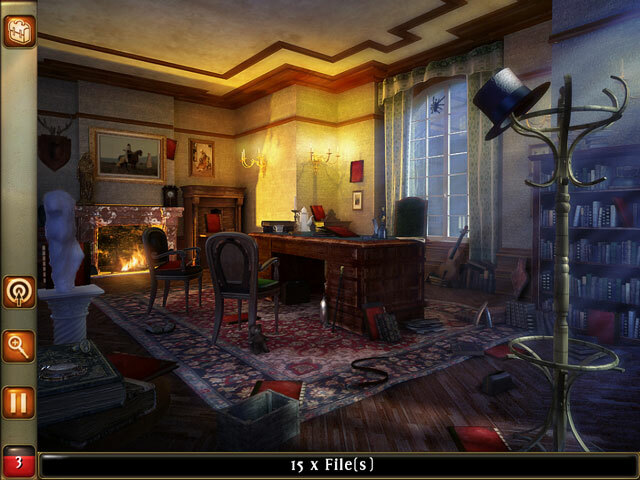 But if you just want a hidden object game to relax with, give this one a try. Rated 3 out of 5 by mrm2006 from This Case is Definitely Strange I truly don't even know what to say about this game. That I gave it 3 stars was extremely generous. The story line was disjointed and the conversations either made no sense or had little or no baring on the situation. The sound effects couldn't have been more annoying - had to turn the volume off. 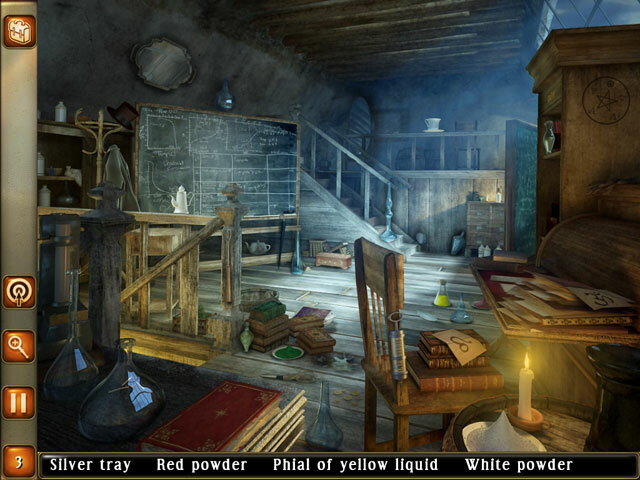 Everything is a hidden object scene and the items are next to impossible to find because they are so small. And, you're not given a full list but 4 items at a time. So, you may need to click on that CANE but not until you find a ton of other items first. Silly. The mini games bordered on tremendously easy to extremely difficult given there were no real instructions. Just, here it is, figure it out. For all the reasons stated above, this is definitely not a buy for me. I, will, however, recommend it for those die-hard mystery fans. Maybe you can make more sense out of this game than I did during the free demo. Happy Gaming! Rated 3 out of 5 by javanjazz from Simple but good visuals. Not bad, but not the greatest. I was able to nearly finish the game in the free trial one hour. I recommend to beginners or for some "light" fun. "light" because as we know the story Dr J and Mr H is nothing but light and fluff. No gore or other things but it does let you use your imaginations. Not recommending to younger audience due to the heavy drug content. Other than that not much of a challenge. Pro: OK story Decent graphics Hint star pops up as you used one hint Time period items (big plus) Well balanced HOS (silhouettes and clues) with mini puzzles Not many going back and forth to the same area (average 2 x as much as I can tell from the free trial) Con: Not much challenge Item clues pop up as you go (great minus) Slow hint recharge Some items too dark or hidden to find. Beginners level challenge Story line text can be only continued by the right lower arrow (instead of click anywhere, big minus) Over all easy light game. Rated 3 out of 5 by tilmalene from Entertaining It's a strang case, ocay game, but not very interesting. 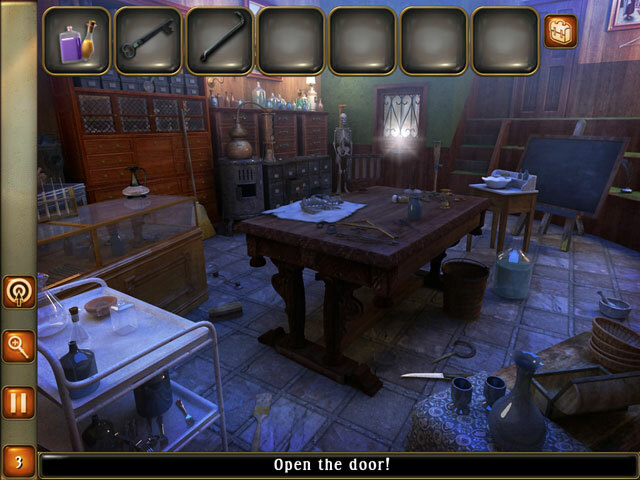 Rated 2 out of 5 by pennmom36 from Dr. Jekyll & Mr. Hyde: The Strange Case I was hoping this would be a really entertaining game because the storyline sounds interesting. Unfortunately the game lacks entertainment. This is a HdO type game with the main feature that allows you to click anywhere on the scene and drag the entire scene around, as well as zooming in and out of that particular area. The items that you are supposed to find are incredibly small and most are unrecognizable despite the fact that you can zoom into the scene. You can click on gold stars that are randomly placed in each location, that will give you an extra hint for each star collected. There are mini games and puzzles available as well. It's a no go for me, if I can't identify any objects, it's just no fun. Rated 2 out of 5 by ed1798 from Terrible The graphics are terrible. Boring. All the dialog gets really old really fast. Rated 2 out of 5 by Rudygeegee from Not Quite Cutting Edge The game looked really interesting so I went ahead and purchased it. What a regret! CONS Graphics were realy grainy Storyline just didn't make any sense, disjointed PROS Sorry, none that I could see.